This edition of Who Pooped in the Park? follows Michael and Emily on a trip through the Sonoran Desert of Arizona and California. 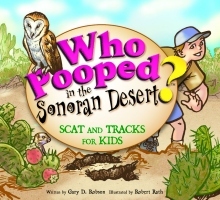 This book will expose children to the incredible amount of wildlife that can be found in the desert. It’s not barren sand dunes! Along with the text and Rob Rath’s delightful illustrations, the book includes a sampling of “Straight Poop” sidebars, giving kids extra trivia about the animals and their scats and tracks.